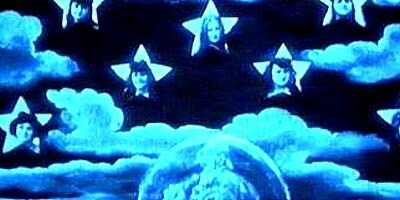 Insofar as there is a distinct and clearly deliberate similarity to Georges Méliès early and magical science fiction fantasy Le voyage dans la lune then it could be argued that Voyage autour d'une étoile is an early piece of silent exploitation cinema. A French and Italian co-production weighing in at a modest six minutes the story still manages to pack as much as possible into it's sadly too brief running time. Our hero lead flies into the sky in a giant soap bubble, discovers a star full of beautiful women in the style of The Queen Of Outer Space and when drifting back to earth with an umbrella parachute he meets with a surprisingly abrupt and gory demise by becoming impaled on a weather vane. While certainly as not beautiful as the Méliès classic this is a film that is not without it's certain charm and possesses an aesthetic that, had it been made today, could well be described as steampunk. Part comedy and part science fiction Voyage autour d'une étoile is a film that would surely appeal to those with a love for cinematic history although those who wish to see this kind of thing at it's very best should probably look to the 1902 classic Le voyage dans la lune instead.